Notice how different things stand out in the different images. In the color images, the strong color contrast really grabs your attention. 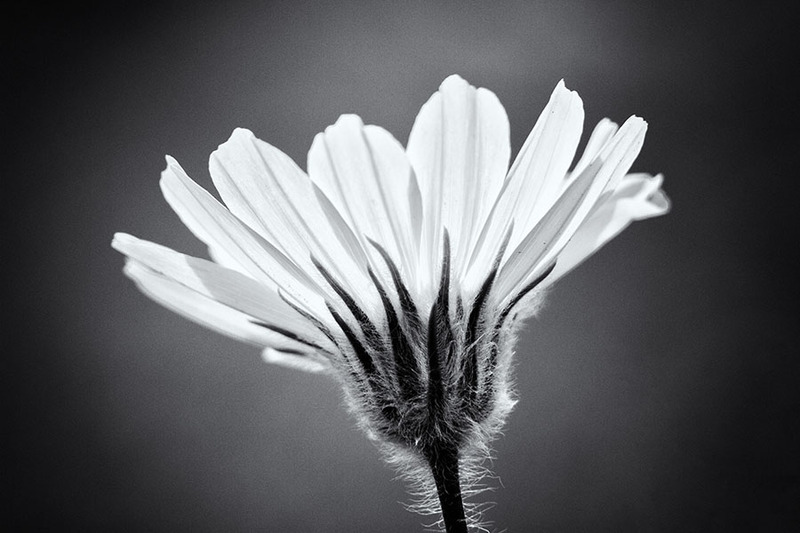 But, in the black and white image, the shadows in the flower and the white hairs on the stem stand out a lot more. The different images also have very different feelings. 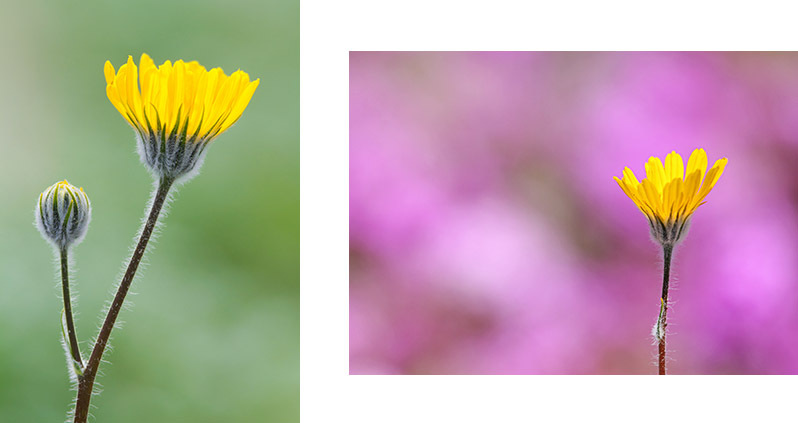 The color images have more of a happy feeling, because of those bright colors and the contrast and because it makes you think of spring (generally, a happy thing for us humans!). But, the black and white image has a more neutral or maybe even a little sad feeling. None of these three images is necessarily better than the rest, they’re just different. Each one says something different about the subject. And, as I’ve said a lot lately: how you photograph your subject should be driven by what you want to say about your subject. I see your point Steve, color can distract from structure. As for sadness, or any other mood, even emphasis on structure can be achieved by composition and lighting as well. It is just a personal preference. When I first started in photography 40 some years ago I worked in the dark room with black and white a lot, then to graduate with my M.A. I had to do color as well with all the timing and chemical expiration issues. I like both but for flowers I do prefer color, even for the macro shots. Just personal preference there is no right, or wrong here but photography is all about the light; after all your camera doesn’t image an object but the reflection of light coming off the object and color is an expression of filtered light. The flower filling the frame in the B&W helps to make a more dynamic image as well in my opinion. But I will be shooting some flowers in B&W next chance I get.